This page will walk through Angular 4 CRUD example using Http class. We will perform create, read, update and delete operation here using Http class. Http performs HTTP request using XMLHttpRequest as default backend. Http class has methods such as post, get, put, delete etc. These methods return instance of Observable. To get data from the instance of Observable, we need to subscribe it. Http is an injectable class and can be instantiated using dependency injection with constructor. In our CRUD example, Http.post will perform create operation, Http.get will perform read operation, Http.put will perform update operation and Http.delete will perform delete operation. Interaction with HTTP should be done within a service class to separate this code from component and hence that will make code easy to understand and help in bug fixing. To run the example we need a server that will respond our request URL. For the demo we are using json-server that provides fake URLs for testing purpose. Now find the complete example step by step. Http performs HTTP request using XMLHttpRequest as default backend. Http is injectable. For any request it returns the instance of Observable. Http has following methods. post: Performs HTTP POST request. get: Performs HTTP GET request. put: Performs HTTP PUT request. delete: Performs HTTP DELETE request. patch: Performs HTTP PATCH request. head: Performs HTTP HEAD request. options: Performs HTTP OPTIONS request. request: Performs any type of HTTP request. 1. CREATE operation using Http.post method. 2. READ operation using Http.get method. 3. UPDATE operation using Http.put method. 4. DELETE operation using Http.delete method. 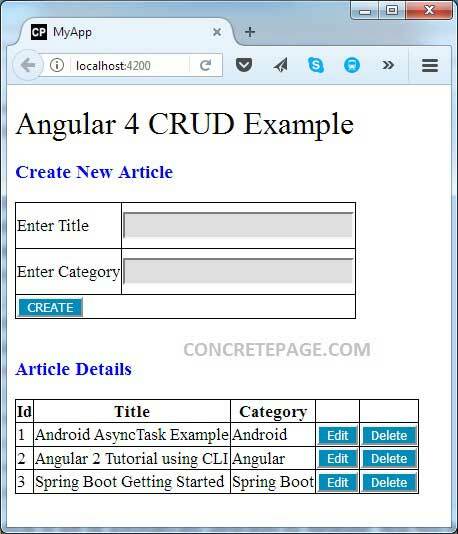 The output of our Angular 4 application for CRUD operation will be as follows. Now we will discuss CRUD using Http step by step. To use Http class, we need to import HttpModule in application module. HttpModule is from @angular/http API. Http is injectable and can be instantiated using constructor. We will perform dependency injection of Http using constructor. Http is the class of @angular/http API. Interaction with HTTP should be done within a service class to separate this code from component and hence that will make code easy to understand and help in bug fixing. Find a sample code snippet to instantiate Http using constructor within a service. We will perform create operation using Angular Http.post() method. It hits the request URL using HTTP POST method. Http.post() method syntax is as follows. The description of parameters is given as below. url: This is the REST web service URL to create article. body: This is of any type object that will be passed to REST web service server. In our example we will create an Angular class as Article and pass its instance to body parameter. options: This is optional. This accepts the instance of Angular RequestOptions that is instantiated using Angular RequestOptionsArgs. Using RequestOptions we pass request parameter, request headers etc. Http.post() returns instance of Observable. Observable is a representation of any set of values over any amount of time. Find the code to create the article. Here we will use Angular Http.post() method. We are passing header Content-Type as application/json. After successful operation we are returning status code as an instance of Observable. Headers is the angular class that is used to configure request headers. We will perform read operation using Angular Http.get() method. It hits the URL using HTTP GET method. Find its syntax. Find the description of the parameters. url: Web service URL to read article. options: This is optional. It is used to pass request parameter, headers etc. Http.get() returns the instance of Observable. Find the Angular code using Http.get() that will pass request parameter to filter the result. URLSearchParams creates the query string in the URL. We will perform update operation using Angular 2 Http.put() method. It hits the URL using HTTP PUT method. Find its syntax. Find the description of parameters. url: This is the REST web service URL to update article. options: This is optional. This is used to pass request parameter, request headers etc. Http.put() returns the instance of Observable. Find the angular code that is using Http.put() method to update the article. In our Angular application we have created a class as Article and we are passing its instance to Http.put() method. The article will be updated for the given article id. We will perform delete operation using Angular Http.delete() method. Http.delete() hits the URL using HTTP DELETE method. Find its syntax. url: Web service URL to delete article. Find the code using Http.delete() method to delete article by id. In the path parameter we are passing article id to delete the article. Observable is a RxJS API. Observable is a representation of any set of values over any amount of time. All angular Http methods return instance of Observable. Find some of its operators. map: It applies a function to each value emitted by source Observable and returns finally an instance of Observable. catch: It is called when an error is occurred. catch also returns Observable. To fetch data from instance of Observable we need to subscribe it using RxJS subscribe operator. The actual hit to server goes only when we call subscribe or use async pipe on instance of Observable. In our example we will use subscribe operator to fetch data from Observable. Find the sample code. //Data from server has been received. json-server is fake REST API to test applications. It is very easy to install and use it with few steps. Step-1: Open the command prompt and run the following command. Now we are ready with json-server . Step-2: Create a db.json file in a directory. In our demo we will perform operations on articles with three fields that are id, title and category. Step-3: Now we need to run the json-server. Go to the directory where db.json file is lying and then run following command. Step-4: In this way, we are ready to use json-server with following URLs. The above URL will fetch all articles. Step-5: For CRUD operation we need to use following URLs. 1. GET /articles : Fetches all articles. 2. GET /articles/1 : Fetches article by id. 3. POST /articles : Create article. 4. PUT /articles/1 : Update article by id. 5. DELETE /articles/1 : Delete article by id. Find the link for json-server reference. return; //Validation failed, exit from method. 1. Start JSON-SERVER. To install and start JSON-SERVER, follow the steps given above in the article. Note: Angular version 4.3 has introduced HttpClient to perform HTTP requests. If we are using Angular version 4.3 or higher, we should use HttpClient. Find the sample examples to handle GET and POST request using HttpClient.